Myphone recently announced on their Facebook Page that they conduct a One Day Sale on November 30, 2014, 12PM at the MyPhone Store, SM North EDSA Annex, 4th Flr. Cyberzone. 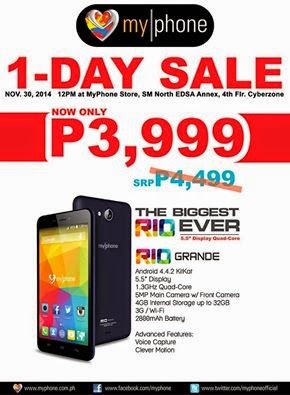 Myphone says the MyPhone Rio Grande will be offered for ₱3,999 on that day. This smartphone has ₱4,999 Suggested Retail Price which means, consumer can avail ₱1,000 discounts. The Myphone Rio Grande features a 5.5 inches display, 1.3 GHz of quad core processor, 512MB of RAM, 4 GB internal storage, 5 MP rear camera with front camera, 3G / WiFi and 2800 mAh of battery.